I am a big fan of thinking outside of the box. I am also a big fan of helping my students do exactly the same thing. This year I considered ways that I could help meet their individual needs more completely during music class. 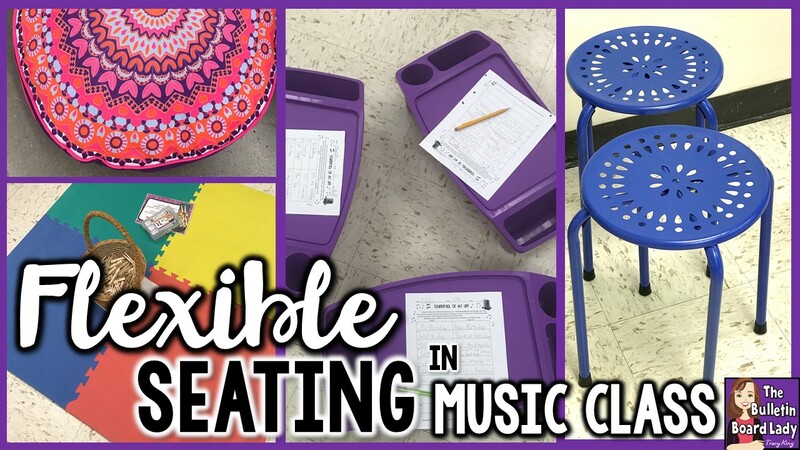 Although I plan lessons and workstations that are differentiated, I was interested in using flexible seating that would also meet their needs. 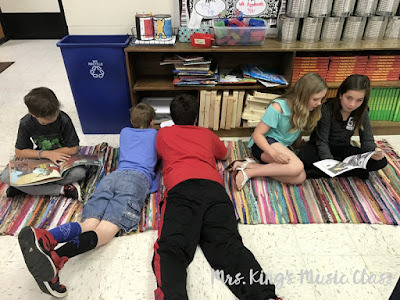 In most of my previous classrooms I have had a large rug or a carpeted room. This automatically meant that I had two good seating choices: chairs or the carpet. In my current classroom my floor is completely tiled. 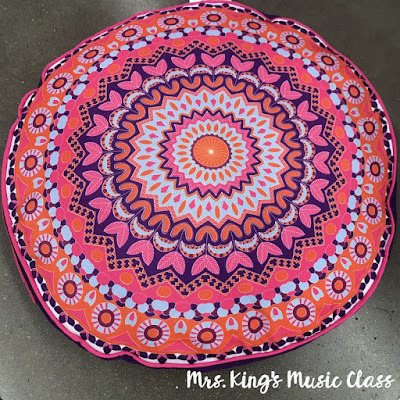 I teach only grades 3-5 so I'm not sure that I want to put out several hundreds of dollars for a large rug. In my K-6 classroom, I used it most often with K-2. I think eventually I may get one, but it is not at the top of the wish list. At the beginning of the school year I read a brilliant blog post from Aileen Miracle about flexible seating in the music room. 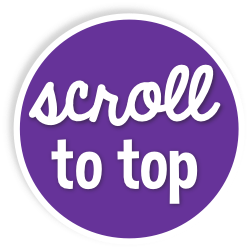 You'll definitely want to check it out. This was just the motivation that I needed to start implementing my own plan for flexible seating in my classroom. For me, the most obvious way to get started was to add multiple seating options to my workstations rotations. I plan workstations about every 4th or 5th class period so this would give me time to add new seats or remove ones that didn't work between workstation days. On a typical day, my classroom looks like this. I have three rows of chairs that have a wide aisle down the middle. 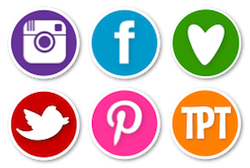 This allows me to be in close proximity to any student within just a few steps. When I have students in centers I focus on putting them around the edges of the room and possibly one in the middle if I need the space. The first new seating option I added were these awesome stools from Five Below. 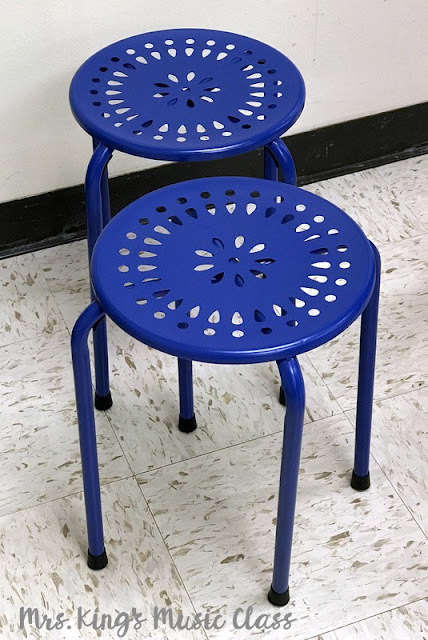 These are NOT wobble stools and I found that I had to remind students not to rock them back and forth. They are pretty sturdy, but some of my 5th graders are adult sized and I didn't want them to bend and break. I bought stools that were all the same color so there wouldn't be arguments about getting a specific color. In this station above, students are working with a magnetic set of Note Knacks on a dry erase board. Not pictured is a student at a table with the original Note Knacks which are wooden blocks. They are creating a secret rhythm and the rest of the group is recreating that with the Note Knacks on the dry erase board. 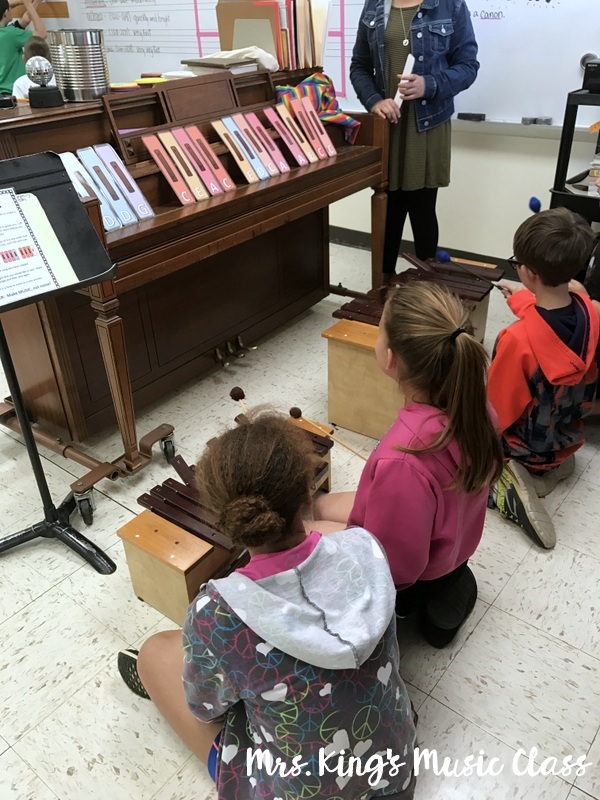 Rhythm Band Instruments carries Note Knacks. You can get them HERE. These lap trays were my next addition. I actually have 5 of them, but this class only needed 3 for each rotation. The lap trays are from Hobby Lobby and were $6 each. I think they would be great for leaving supplies for a center too. You could put worksheets in the middle, clipboards in the large hole and pencils, rhythm sticks or whatever in the smaller compartments. I bought all the same color for the same reason my stools are the same color. I think these are my favorite new option for flexible seating and they are the easiest to find and use. These rag rugs are from Five Below. They are large enough to fit students and an activity. When we are finished using them, I have students roll them up and store them at the front of the classroom. On days when we are watching a video, students can stack their chairs and sit on a rug instead. I think that I will pick up a few smaller rag rugs from a dollar store to use for individual seating options. They are inexpensive and clean well if needed. I've seen these mats around forever and really hadn't considered them useful in my classroom until this year. When they are separate, they are great for individual seating. When they are together they are perfect for small group work. The set that I chose has four different colors. 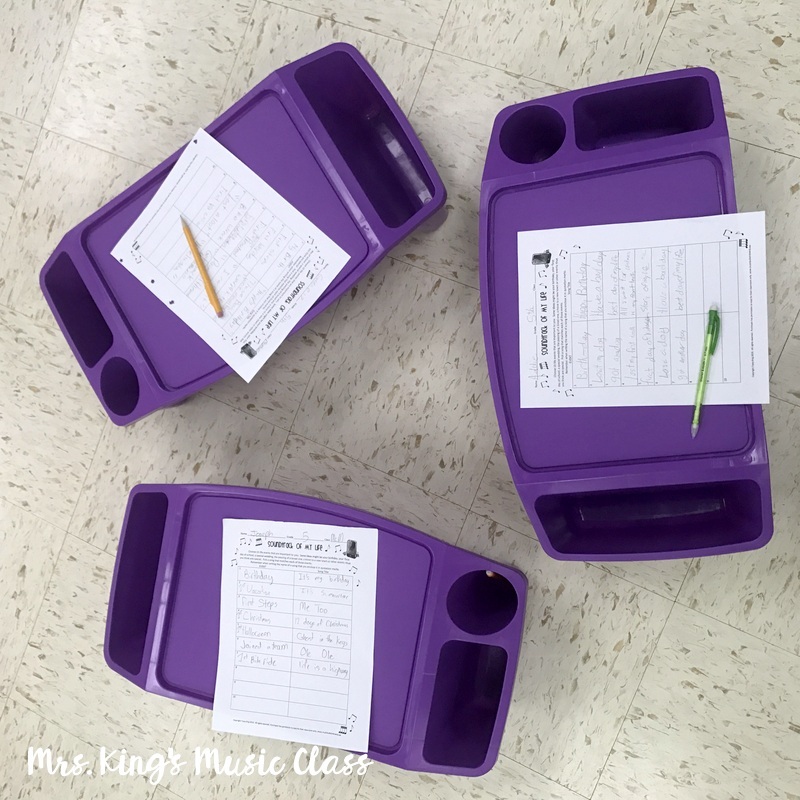 This was PERFECT for sorting pictures of instruments into their instrument families. It would also be great for creating 4 part canons or rhythmic pieces for 4 different instruments. I also love the way these foam mats very clearly define the space for workstations. Why not? The PE teacher does it every day! Sometimes there just isn't a good way to put down a rug, stool or mat and that's okay. This station is my Xylophone Composing Station. 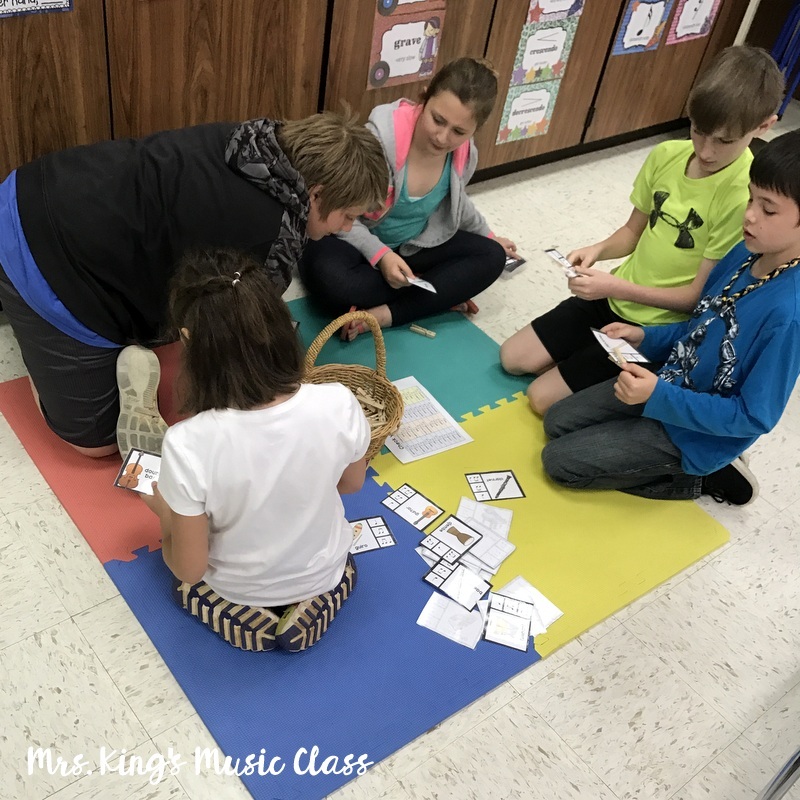 We used the piano as a long music stand to hold the cards and students sat on the floor with their instruments. Oddly enough, this was the toughest flexible seating option to find for my classroom. I wanted something that an adult sized booty could sit on, but also had to be able to be wiped down or laundered with ease. So many of the pillows I found would not be easy to clean and to get them large enough were too expensive. Once again Five Below to the rescue! These cushions are large and thick and only $5! They are also covered in polyester which is easy to wipe down and dry quickly. Not every option for flexible seating needs to be actual seating. I found that students really enjoy standing workstations and the more I researched flexible seating the more options I saw for creating them. I have a rolling cart in my classroom that is perfect for a standing workstation. I just wheel it to the area I want the station to be and put the supplies on it. Easy! So, I tried a few things that did not work well for me. I may try them again some day, but right now they are back in storage. 1. Yoga Mats - These adorable mats were comfy and inexpensive. They were also much more than my students could handle. They picked at them and left piles of little mat pieces every where. 2. Lawn Chairs - I had several collapsible, camping chairs that I tried. These are the kind made with a thick polyester material over a metal frame and can be stored in a bag with a shoulder strap. The students liked these, but I didn't have a neat and tidy way to store them. I also had a few students fall over in them. I know. I don't exactly know how that happened either but since I wasn't sure I liked them anyway, I took them home. There are several seating options that are on my wish list. 1. Yoga Balls - My PE teacher has these and puts them in regular milk crates for Drums Alive. So much fun! I would love to have these in my classroom, but just don't have a place to store them. 2. Crate Seats - I think this may be a summer or weekend project. I love the idea of creating a neat set of crate seats that can be used for seating and storage. They stack easily so they should be easy to store. 3. 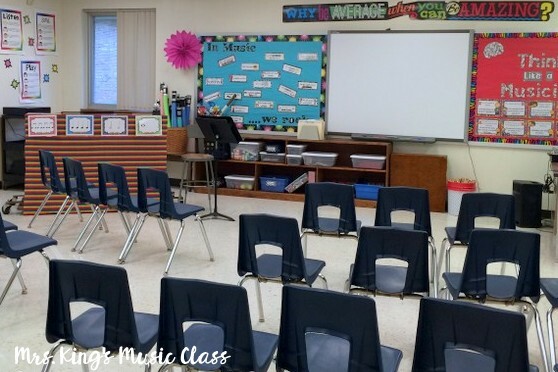 Wobble Chairs - I would love to have 4 or 5 of these for my classroom! Right now it is really just their expense. Each of these awesome seats can be $60-70. 4. Bean Bags - I think these would be a great addition because they would be easy to clean and add a punch of color. For me, figuring out a way to store them would prove problematic. 5. Carpet Squares - I've used carpet squares before and really enjoyed them. It might be possible to get these donated from a local carpet dealer. 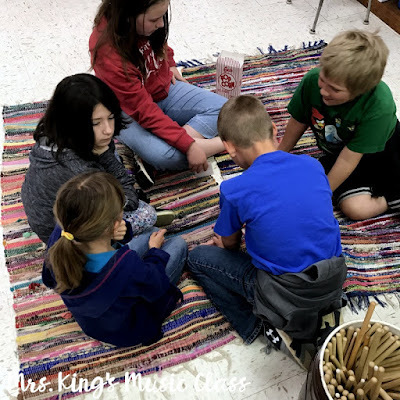 I hope that you find these ideas helpful as you consider how to implement flexible seating in your classroom. 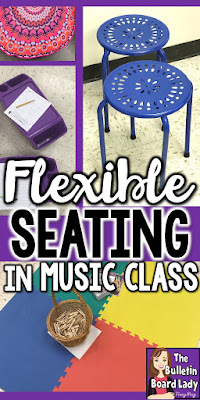 If you are already using flexible seating, I'd love to hear about the ideas that have worked in your classroom. Ikea has "door mats" for just a buck each. They are a nice size, but a boring dark grey color. I bought 8 for a game, and was thinking about getting a class set (would need at least 35). I like some of the choices you have here. Thanks for this. Great ideas as always! I have used carpet squares in the past. A carpet store either donated them to me or sold them to me for like $1 a square. They were worth it! I had 4 bean bags this year for 2 of my workstations. I bought them at Walmart and my school paid for them. Two of them held up the whole year, while the other two ended up with holes in them. The students were tempted to jump on them or touch them every day whether or not we has centers. I threw the ripped ones away and am holding on to the others for next year. Great ideas. I'm all for alternative seating if you have room. It is a challenge when you go from k-5th or 6th.